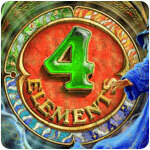 4 Elements Game Review - Download and Play Free Version! The magic of the 4 Elements that has sustained the kingdom for hundreds of years has been taken over by evil powers. The altars throughout the land no longer yield the energy of life and everything is dying! Your help is needed. Solve puzzles to unlock the 4 ancient books of magic and collect 16 mysterious cards that will help you restore the kingdom to life. An adorable little fairy will be your aide in this perilous journey as you encounter elementals, dragons, knights, and various magic creatures. 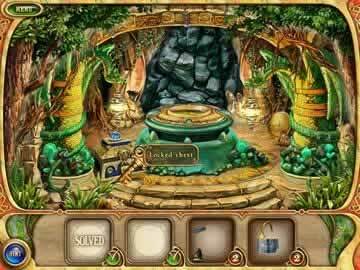 Using a mix of classic addictive game play ideas like match 3 and point and click adventure, 4 Elements takes puzzle game play to a new level. 4 Elements presents innovative twists, explosive bonuses, spectacular visual effects, and a fascinating storyline in amazing animation. Highly recommended for puzzle game fans! In 4 Elements, a kingdom that was once a blissful paradise now faces death and destruction as a result of the misuse of magical powers. You'll need to solve puzzles to unlock the 4 ancient books of magic and restore the kingdom to life. There are several types of puzzles you'll face as you make your way through the game. Various powerups add to the excitement and action as you solve puzzles. A forest fairy guides you throughout game, teaching you how to play and giving helpful hints. Not only does this game bring excellent gameplay, but it great visuals as well. The majority of gameplay in the game consists of match 3 type action. There's a magical energy on the level that flows like a liquid. Between the magical energy and the end of the level are a bunch of blocks with different colored symbols on them. You need to create chains of three of more adjacent symbols of the same color to destroy these blocks and guide the magical energy to the end of the level. Longer chains of five or more symbols will create large explosions that can destroy a large group of blocks at once. As you progress through the game, you'll earn various powerups that may be the only way to beat some levels. These powerups allow you to remove certain blocks, clear away obstacles, and more. They add a lot of excitement to the game and come in handy if you get stuck. There are 64 levels in 4 Elements split amongst the four magical books (fire, air, water, earth). Each book has 4 cards in it depicting various monsters/creatures, with 4 levels per card. The levels differ on your progress in unlocking books and cards. Several levels have you locating the pieces of various items in a room and putting them together to find a key and unlock the books. Other levels have you trying to find several differences between two pictures. The majority of levels, however, consists of different layouts and obstacles in a match 3 game. You'll face obstacles like boulders that block your path, frozen blocks that require multiple matches to break, blocks that require several matches to break, flaming arrows you need to reach, and more. There's a lot of variety from level to level to keep you engaged and interested. One downside to the game is that there is only one mode of play. As a result, the game is somewhat short with little replay value. The limited play is disappointing given the unique and fun puzzle mechanics you typically deal with that could have been used and changed to add more modes and variety to the game. Learning the controls and how to play in 4 Elements is a simple task, largely as a result of the helpful hints and information provided to you when you begin the game. A forest fairy character helps you from them minute you begin playing, explaining the basics you need to know. As you progress though the game, this fairy gives you more helpful information on levels and powerups. This help and information allows you to jump into the game right away and focus on the action. The presentation in this is absolutely excellent. There's an introduction that gives the basics of the game's story (with a voice over as well). The graphics are all very sharp and colorful. Both the graphics and music fit very well with the fantasy theme of the game, and don't detract from gameplay in anyway. 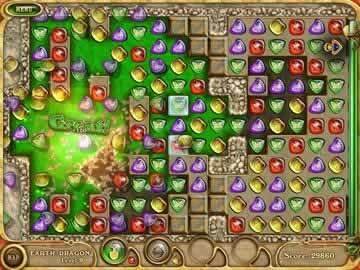 4 Elements is a great puzzle game that's suitable for both puzzle fanatics and other players. There's a somewhat interesting story with cool introduction that you don't usually get for this type of game. There's a lot of help and hints to get you started and keep you progressing. There are a few different types of puzzles from match 3 action to finding items hidden items in a room. A consistent and excellent presentation round out this game nicely. It may not last as long as you'd like, but you'll enjoy the game every step of the way.